American Heroes Channel (Filming Completed 2014) "Wartime Rosies"
IMDb Movie Cast listing "Flying By"
STEPHEN MICHAEL SHEARER was born Stephen Sypult in Bloomington, Illinois. His father was a retired Navy Chief Petty Officer, and his Tennessee-born mother was a former R.N. As a youngster, Stephen wrote his first screenplay, Hellen and Ellen in the Wilderness, and was featured on local radio programs talking about library research. Raised in Illinois and Michigan, he graduated from high school in Northwest Arkansas, where he was an editor of his school newspaper, and an All-State musician (double bass). Majoring in voice in college and trained on cello, bass, baritone and French horn, Stephen was an honorary member Kappa Kappa Psi, and received a Bachelor of Science degree, in both vocal and instrumental music education with a minor in psychology, from Missouri Southern State College (now University), where he also pursued post-graduate work in Theatre Arts. While a student, Stephen hosted a CBS-TV affiliated afternoon show "The Movies" over KUHI-TV (now KSNF-TV) in Joplin, Missouri. He was also the station's Public Service Coordinator and Program Director. As host of his own television show, Stephen interviewed local and national celebrities, and was himself a guest on several local TV programs. He was awarded a three year academic scholarship and was the MSSC Drum Major. He directed the MSSC College Players' first film Desert Passion. After graduation, he taught music briefly in the public school system, and was positioned in corporate travel with American Airlines, Cunard Line, Celebrity Cruises, and American Express for several years. He has also acted extensively in community theatre and in short films, as well as modeled professionally in Minneapolis, Tulsa, and Dallas before moving to New York. 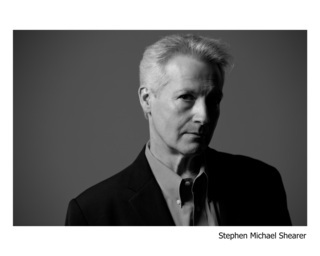 Taking his professional name of Shearer, Stephen appeared in the Oral Roberts University Television's production of August Strindberg's The Father, and starred in an episode of the nationally syndicated TV series Juvenile Court. He was featured in several episodes of the CBS television series, Dallas (1982-1983), and in such films as Split Image (1982), with Peter Fonda and Elizabeth Ashley, and the British-produced Deep in the Heart [Hand Gun] (1983), directed by Tony Garnett. Stephen also performed in the Dallas Opera production of Giuseppe Verdi's rarely staged Ernani. After moving to New York, he appeared in the 1982 film The Cotton Club, numerous episodes of the CBS dramatic series Central Park West (1995), and was seen in various off-Broadway stage productions including a starring role in The Appointment (Nat Horne Theatre), which won the coveted Samuel French Award as one of that year's Best One Act Plays. He also directed the well-received off-Broadway original play The Night Before September (Harold Clurman Theatre). Stephen contributes film research to the Academy of Motion Picture Arts & Sciences (The Margaret Herrick Library) in Los Angeles, and has written several theatre and motion picture, and film book, reviews (some published in The Film Collectors Registry). He lectures on film history and biography. In 2009 he was featured opposite Patricia Neal and Billy Ray Cyrus in the LIFETIME network motion picture Flying By, and in the documentary The Green Girl in 2013. His first book, Patricia Neal: An Unquiet Life was awarded the Southern California Motion Picture Council's "Golden Halo Award" for Best Film Bio of 2006. He has recently written "The Legendary Las Vegas Headliners" profiles for The Las Vegas Review-Journal, and in 2010 was published his second book, Beautiful: The Life of Hedy Lamarr. His latest biography is Gloria Swanson: The Ultimate Star (2013). Stephen Michael Shearer lives in the Twin Cities in Minnesota and in New York, and is working on his next two film biographies. Mr. Shearer's biography is listed on the Internet Movie Database (IMDb) and in Contemporary Authors (2008).